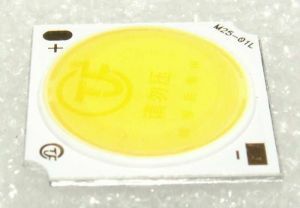 Low and high power LEDs. Superbright red LED, case diameter 5 mm, supply voltage 3.3 V, current 25 mA, luminosity 25 000 mcd, flaring angle 20 degrees. Quantity discounts: over 9 pcs - 10 %, over 99 pcs - 20 %, over 999 pcs - 30 %. Luxeon type LED, input 1 Watt, base (hexagon) diameter 20 mm, supply voltage 3.5 V/280 mA, luminous flux 45 lm, flaring angle 120 degrees. Superbright warm white LED, case diameter 3 mm, supply voltage 3,2 V, current 25 mA, luminosity 10 000 mcd, flaring angle 30 degrees. Quantity discounts: over 9 pcs - 10 %, over 99 pcs - 20 %, over 999 pcs - 30 %. 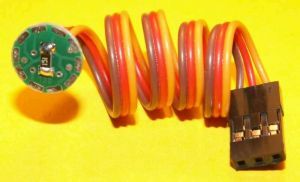 Driver can supply LEDs by current settable from 100 to 800 mA. Current can be set by trim in every channel. Efficiency is 75 %. 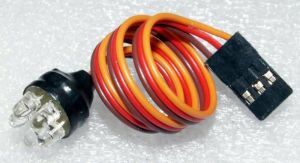 Supply voltage can be from 5 to 20 V.
Superbright orange LED, case diameter 3 mm, supply voltage 2,2 V, current 25 mA, luminosity 8000 mcd, flaring angle 30 degrees. Quantity discounts: over 9 pcs - 10 %, over 99 pcs - 20 %, over 999 pcs - 30 %. Superbright red LED, case diameter 5 mm, supply voltage 2 V, current 25 mA, luminosity 6000 mcd, flaring angle 20 degrees. Quantity discounts: over 9 pcs - 10 %, over 99 pcs - 20 %, over 999 pcs - 30 %. Superbright red LED, case diameter 3 mm, supply voltage 2 V, current 25 mA, luminosity 2000 mcd, flaring angle 20 degrees. Quantity discounts: over 9 pcs - 10 %, over 99 pcs - 20 %, over 999 pcs - 30 %. 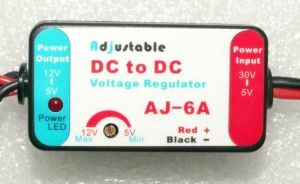 Basic description: switched stabilizer, input voltage 5 to 30 V, output adjustable voltage 5 to 12 V, current 6 A, output connectors JST and JR. LED XEON 20 Watts warm white. Bright LED, power 20 W, color warm white, supply voltage 31 to 33 V, current 600 mA. Dimmension 19 x 19 mm, diameter 16 mm. 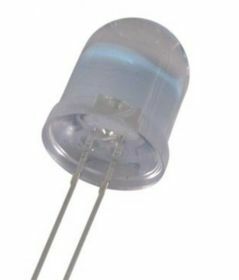 Superbright blue LED, case diameter 3 mm, supply voltage 2 V, current 25 mA, luminosity 5000 mcd, flaring angle 30 degrees. Quantity discounts: over 9 pcs - 10 %, over 99 pcs - 20 %, over 999 pcs - 30 %. Superbright orange LED, case diameter 5 mm, supply voltage 2 V, current 25 mA, luminosity 6000 mcd, flaring angle 20 degrees. Quantity discounts: over 9 pcs - 10 %, over 99 pcs - 20 %, over 999 pcs - 30 %. Basic description: controlling electronic circuit for light beacon, for five LEDs, adjustable speed and direction of rotation, deceleration and overlap neighboring LEDs. Superbright red LED, case diameter 5 mm, supply voltage 2 V, current 25 mA, luminosity 2000 mcd, flaring angle 20 degrees. Quantity discounts: over 9 pcs - 10 %, over 99 pcs - 20 %, over 999 pcs - 30 %. Superbright red LED, case diameter 3 mm, supply voltage 3.3 V, current 25 mA, luminosity 8000 mcd, flaring angle 30 degrees. Quantity discounts: over 9 pcs - 10 %, over 99 pcs - 20 %, over 999 pcs - 30 %. 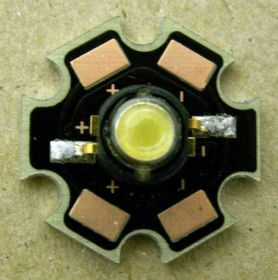 Basic description: light beacon microprocessor controlled, five amber LEDs, adjustable speed and direction of rotation, deceleration and overlap neighboring LEDs. Superbright red LED, case diameter 5 mm, supply voltage 2 V, current 25 mA, luminosity 8000 mcd, flaring angle 30 degrees. Quantity discounts: over 9 pcs - 10 %, over 99 pcs - 20 %, over 999 pcs - 30 %. 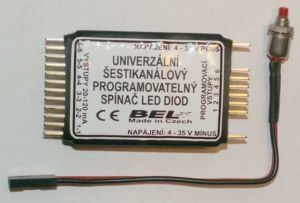 Basic description: light beacon microprocessor controlled, five red LEDs, adjustable speed and direction of rotation, deceleration and overlap neighboring LEDs. Superbright red LED, case diameter 5 mm, supply voltage 2 V, current 25 mA, luminosity 7000 mcd, flaring angle 30 degrees. Quantity discounts: over 9 pcs - 10 %, over 99 pcs - 20 %, over 999 pcs - 30 %. Basic description: light beacon microprocessor controlled, five blue LEDs, adjustable speed and direction of rotation, deceleration and overlap neighboring LEDs. 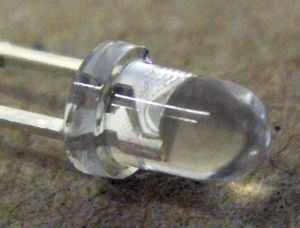 Bi-color (red and green) LED, antiparallel, diffused package, 5 mm.